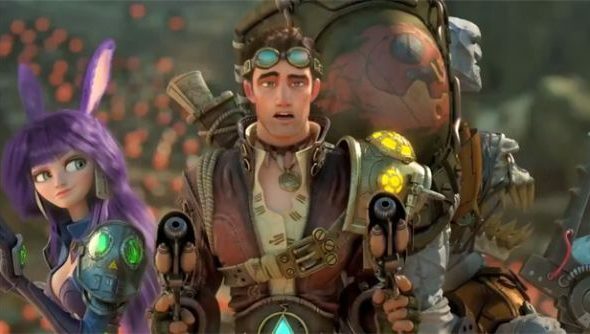 Wildstar is a promising new prospect from Carbine Studios, the outfit formed by a number of senior WoW figures in 2005. It stands apart from its peers for a couple of reasons: not least its low-gravity double jumps and player-built fortresses. But also because it’s a new MMO that isn’t free-to-play. Yup: Carbine are plumping for ye olde monthly subscription model. But here’s the clever bit: they’re tying it to a currency system that’ll mean dedicated players never have to pay a penny. When players buy a copy of Wildstar, they’ll enjoy the industry standard 30 free days of game time. Once that’s up, they’ll be required to stump up for a $14.99 / £8.99 subscription – unless they turn to CREDD. CREDD is one of them silly backronyms – Certificate of Research, Exploration, Destruction and Development. It’s also an in-game item that can be redeemed for game time. 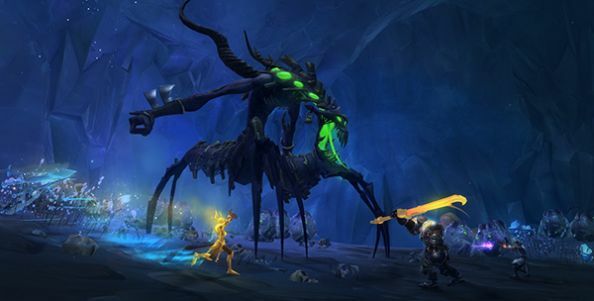 Players will trade CREDD for in-game gold on Wildstar’s Commodities Exchange. The precise exchange rate will be established by the community, but Carbine anticipate that players will be able to gain enough CREDD (a phrase I’m sure they enjoy) to stave off next month’s sub fee perpetually. Carbine’s system will sound familiar to anybody with a working understanding of Eve Online’s PLEX currency, which already sees a portion of the game’s playerbase subsist in deep space – without ever deigning to pay CCP for the privilege. “PLEX is a good reference point,” Gaffney told us. “I think it’s a killer system. It’s been very well supported by fans, because it’s very fan-friendly. “Hey, do you want to buy gold in the game but don’t like gold farmers? Well, if you can buy a CREDD or buy a PLEX or trade it to other players then for the gold you get the same equivalent effect of that without actually funding a gold farmer. Hey, if you want to play for free and not pay for a subscription at all – okay, cool, earn enough gold, earn enough ISK, trade it for a month of game time and it’s a win. Gaffney is especially keen on the idea of co-opting a market normally dominated by gold farmers for the good of the game. And what a market. Carbine carried out some Lineage item market analysis when they were first founded, and found that players were paying “about a billion dollars for different items in the game” on eBay. “You’re using that same sort of desire on player’s parts and that same willingness to put money in the system to fund your players who want to play for free,” Gaffney explained. “Personally I’m much happier with, ‘Hey, Bob wants to get an extra million bucks in the game or an extra million gold pieces in the game’, and so he’s willing to pay some other player’s subscription to basically give them the money. “I like that about ten thousand trillion times more than I like funding some spamming dude who’s trying to gouge money out of the system. But what of the free-to-play revolution? Rift was perhaps the last fairly traditional subscription MMO to be considered a success, and that’s now very much not a subscription MMO. Those that remain are either WoW, now rapidly declining, or outliers like Eve or Love. What about Wildstar makes a subs option viable? “Personally, I have an opinion on the subject that’s maybe controversial,” replied Gaffney. “But that is that I don’t think your success or failure is dominated by your business model as much as anything else. I think we’ve seen some games that had pretty good box sales when they came out the gate, they did pretty well – but they struggled to hold people over the long term. “We’re in a business where the one thing you know will fail is stuff that has been done before. So each game that succeeds in our market has to be unique in really distinct ways. I don’t think business models are a factor in that – I think game design and game cleverness is the determining factor.